Holmes takes Anna to his hotel when he knows that most guests will be at the World’s Fair. He asks Anna if she would mind going to his walk-in vault and picking up some papers. Anna goes to the vault, and Holmes follows her quietly. When she walks inside, the door closes behind her — Anna is embarrassed, and knocks on the door, calling for “Harry.” Holmes listens to Anna’s cries, and feels peaceful and content. While the air grows stale in the vault, a pleasant breeze blows through his office. Holmes prefers to kill from a distance; he enjoys the sense of immense power he wields over Anna. Larson emphasizes the difference between their two positions: Holmes with his pleasant cross-breeze, Anna with her stale air. It’s this same contrast that pleases Holmes so greatly. It’s disturbing that Anna doesn’t realize that she’s been trapped; she thinks there’s been an accident. Even when Holmes is murdering her, she continues to trust him. Anna beats the door with her shoe as the vault gets warmer and she begins to lose her breath. She thinks that Harry must be in another part of the building, unaware that she is locked in. She begins to grow afraid, but she reassures herself by thinking of the pleasant visits she will make to Milwaukee and New York. Larson’s description of Anna’s death is agonizing in part because she’s so naïve about her fate. It’s enormously poignant that she thinks ahead to her trip to New York, which we know will never come, even as she’s slowly dying. Holmes hears Anna banging on the door, and does nothing. He thinks that he could open the door and weep with Anna, open the door and then close it again, or leave the door closed and fill the vault with gas. He continues to sit and listen to Anna crying. He enjoys these moments, because they give him a sexual thrill. He fills the vault with gas. It isn’t enough that Holmes kill Anna; he has to let her know that he’s killing her. For this reason, he gasses the vault, first contemplating opening the door and then closing it again. It’s interesting that Larson doesn’t continue writing from Anna’s perspective after she realizes that Holmes is killing her — perhaps her shock and agony is more terrifying when it’s left implied instead of explicitly written. Holmes travels back to his apartment and tells Minnie that Anna is waiting for them in the hotel. Holmes seems peaceful and well-rested, and tells Minnie that he likes her sister. Holmes derives genuine pleasure from murder. As always, he maintains an appearance of normality and kindness around others. Two days later, the Oker family receives a letter from Holmes telling them that he no longer needs an apartment. Surprised, the Okers look in the apartment, and see evidence of hasty packing. A while later, a trunk addressed to Anna or “H. Gordon” is sent from Midlothian, Texas to Chicago, but no one claims it. Evidence of Holmes’s actions are everywhere, but no one realizes what they are evidence of. The Okers are slightly suspicious of Holmes’s sudden departure, but the grotesqueness of his crimes keep them from guessing what, exactly, he did. Holmes employs a man named Cephas Humphrey who lives in Englewood, and asks him to remove a box and trunk from his hotel. Humphrey thinks that the hotel looks awful, but later says that Holmes didn’t give him enough time to think about it. Humphrey takes a long, coffin-shaped box out of the building, and Holmes tells him to lay it flat, rather than straight up. Humphrey delivers a heavy trunk — later, he can’t remember where he takes it, but evidence suggests that he takes it to the home of Charles Chappell. Holmes uses one of his favorite tricks — encouraging workers to move quickly, so that they don’t have time to grow suspicious about the building they’re in. Charles Chappell continues to faithfully produce skeletons for Holmes — by this point in the book, we know all the steps in Holmes’s routine, from the seduction to the murder to the selling of the corpse for profit. Holmes gives Pitezal’s wife dresses, shoes, and hats that belonged to Minnie, but he says they belonged to his cousin. He also gives his caretaker, Pat Quinlan, two trunks, each with the initials MRW. Holmes is so fastidious that he doesn’t waste his dead victims’ clothing. No one realizes that his generosity is only possible because he’s committed a horrible crime. Arn, Jackson. "The Devil in the White City Part 3, Chapter 14: Claustrophobia." LitCharts. LitCharts LLC, 1 Jul 2015. Web. 23 Apr 2019. Arn, Jackson. 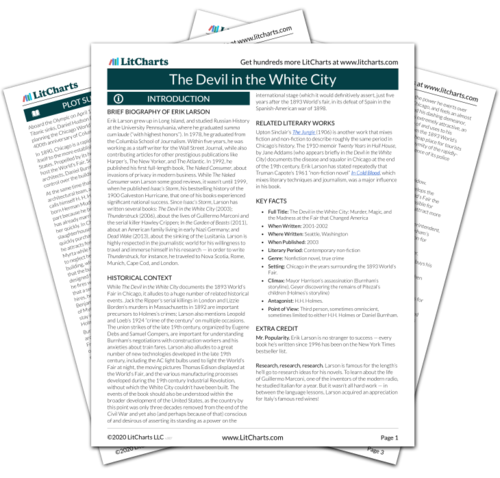 "The Devil in the White City Part 3, Chapter 14: Claustrophobia." LitCharts LLC, July 1, 2015. Retrieved April 23, 2019. https://www.litcharts.com/lit/the-devil-in-the-white-city/part-3-chapter-14-claustrophobia.